We don’t know about you, but every time we start to sizzle a little bit of garlic in a pan, more faces pop through the kitchen door to discover the source of the delicious smell. Sliced, toasted or baked, just like Barrett’s Ridge beer bread, there are a million different ways to enjoy garlic. 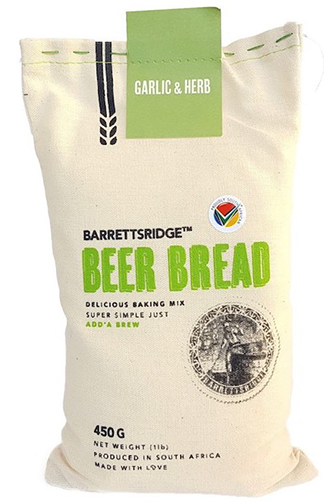 So we thought: why not add another one in the shape of Barrett’s Ridge Garlic & Herb beer bread? Top your Barrett’s Ridge Garlic & Herb beer bread with pesto. The nutty base of the pesto is the perfect match for the malt in the beer and the bright green colour definitely announces the arrival of summer at your lunch table. Pour entire contents of Barrett’s Ridge Garlic & Herb into a bowl. Chicken soup forms the perfect earthy building block to showcase the Barrett’s Ridge Garlic & Herb mix. And light broth is sure to seep into every corner of a fleshy piece of bread. Sundried tomato and feta aren’t only delicious when added to Barrett’s Ridge Garlic & Herb, it’s a visual feast too. Slice into a loaf and spot the hidden red gems and tiny pillows of soft, warm feta cheese. Seconds anyone? The Barrett’s Ridge bread bakers recommend pairing our Garlic & Herb mix with Pilsner. The Pilsner’s hint of sweetness brings out the natural sweetness of the garlic.